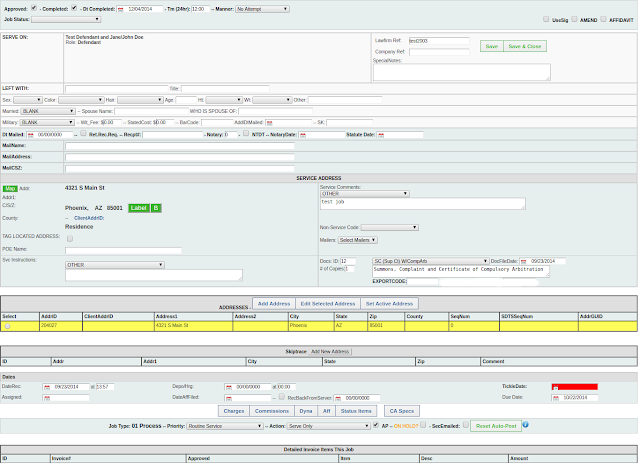 1) Made Job Type required on Add Defendant and Add Address. 2) Added NEW Batch route feature to Report "With Selected" section. Not working right for you? Let us know, you just need a google map key. 3) Added Case Notes to splatter fields options. 4) Altered Programmable Event Rules to have a Must Have Court Case Number option. 5) Advanced Search updated with Exceptions section lets you search for things that are NOT there also. This one is HUGE. Need anything on it? Let us know, we got your back!